Astronauts on the International Space Station prep two spacesuits for a spacewalk. Image captured Dec. 16, 2013. Repairing a problem with the International Space Station's vital cooling system will require two or three spacewalks over the next week, NASA officials said today (Dec. 18). NASA astronauts Mike Hopkins and Rick Mastracchio will venture outside the orbiting lab for the first holiday spacewalk on Saturday (Dec. 21), with the two subsequent extravehicular activities (EVAs) scheduled for Dec. 23 and Christmas Day (Dec. 25). The upcoming EVAs will be the first United States spacewalks performed since Italian astronaut Luca Parmitano's spacesuit filled with water, cutting short his EVA with NASA astronaut Chris Cassidy in July. Hopkins will be using Parmitano's suit during the spacewalks, and NASA officials are confident that it will function normally. "We have done quite a bit of research on this [spacesuit problem] and we have decided to take a look at using Luca's suit again," NASA flight director Dina Contella told reporters today. "Mike Hopkins will be wearing that particular suit. We think that's an extremely clean suit, and it's ready to go." 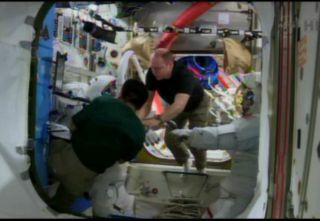 Astronauts on the station have also installed a snorkel-like tool in their spacesuits in case the flooding issue happens again during the spacewalks. Hopkins' and Mastracchio's helmets have also been outfitted with an absorbent pad that will help them detect if water is flooding their suits. The station's cooling-system issue began on Dec. 11 when a malfunctioning valve in one of the station's two external cooling loops forced a pump module to shut down after it registered lower-than-normal temperatures. The issue resulted in the power-down of some of the station's non-critical systems, including scientific experiments in two of its laboratories. "To date, we haven't lost any research." NASA's Mike Suffredini, International Space Station program manager, said today. "We've had to manage what research we do." The first spacewalk will aim to prepare the failed pump module for its removal and prep the spare pump — stowed on an outside part of the space station — for its installation during the second spacewalk. During the Dec. 23 spacewalk, Hopkins and Mastracchio will work to remove the failed pump and begin installing the new one. The third EVA, if necessary, will stow the failed pump for possible future repairs and finish installation on the new one. The launch of Orbital Sciences' Cygnus spacecraft's first official supply trip to the space station is now pushed into next month. Cygnus was set to launch atop Orbital Sciences' Antares rocket on Thursday, but because of the spacewalks, the launch has been deferred until Jan. 13 at the earliest.